This week I received in the mail, the perfect form of motivation for a long overdue project! Do you see that awesome paint kit below? It is a new line of decorative finishes from Country Living called Caromal Colours...Distressed For Success. I won this fabulous prize from a giveaway I entered at A Soft Place To Land a couple weeks ago. The only catch to accepting it, was that I had to complete a project with this kit and blog about it. Of course I instantly agreed. I have a ton of never ending projects on my to do list, and this was just the motivation I needed to get at least one of them done. I chose the color "Peppercorn"...which is basically just blah blah black. But once you're finished putting the toner on and distressing it...it is anything but boring! And here is my victim in all of her heinously hideous glory! Seriously, this little lady needs some lovin'. It was given to us by my mom when we first got married almost 12 years ago when we had no furniture. Unfortunately it has been our nightstand ever since. So sad...on so many levels. And the icing on the cake...(or the arsenic, whatever) is that it perfectly matches my floors that I absolutely despise! Did I mention that it has this lovely hardware that I cannot wait to replace? Do you see where the paint is scratching off? Um yeah, the silver was my way of improving this ugly thing. Ummmm...not so much. My goal is to have it ready by Monday. My new friend, Beckie at Infarrantly Creative, is hosting a Roadkill Rescue Party. Don't you just love the title...so catchy I couldn't resist. So if anyone would like to join in get those posts ready. The only catch? Your post has to be about an item you made over that was free, found, given to you, or dropped from the sky in your front yard...something you spent no money on. Easy, right? Oh, and I almost forgot...there's a prize package. Not just 1 prize but a whole package full of really great items. And it just so happens that yours truly donated one of her new fleur de lis signs to go in that awesome package! Do you want to win this? Just the canvas.....not the door .....or the house. I think my sister might get a little ticked at me if I gave away her new house! On a side note...my big sis has the most amazing house EVER. Like, even the closets are awesome. I'm thinking about moving into her pantry and taking up permanent residency. Maybe I'll take you on a tour sometime soon. Would you like that? Let me answer that for you.....yes, you would most definitely like that! Maybe she'll start renting out her closets.....just a thought. I'm excited to share with y'all some of the new items I've been working on for my etsy shop. They are 12 x 12 painted canvas boards that are then decopauged with your choice of initial or fleur de lis (images can be done in solid colors or patterns...you choose). Some of these were custom orders, others are listed in my shop waiting for a new home. Let me know if you're interested in anything you see that's not currently listed...I can re-create it for you! I'm linking this post to Xazmin's Modge Podge Mania @ This is The Year. I recently scored these hunter green tassels circa 1985 at a yard sale for 25 cents each. I loved the toppers and the fluffy fullness they had...and the price was just right. Not loving the color so much, but I thought maybe a little nip and tuck would do wonders. So, they came home with me. A little of this and a little of that, a smidge of hot glue, and several burned fingers later...this is what I came up with. I like them, even though I can see still some of that lovely green peaking through. I chose some pretty bright colored trim that I hope will ,not only compliment them, but camouflage that color too. It's not designer decor, but for two quarters...I can live with it. In the words of Project Runway's Tim Gunn..."Make it work!" This post is also linked to Kimm at Reinvented for Trash to Treasure Tuesday! Update : this post is linked to Thrifty Decor Chick's Before and After Party. I couldn't bear to start my post off with the before picture of my desk. All the ugly cords and wires that my hubby has told me for way too long that he would take care of...but never did, it was all too much for me to stand to look at anymore. And I couldn't put my dear readers through the pain of that ugly pic coming first! YIKES...and here's the before. The whole awful truth and nothing but the awful truth. I have a tiny confession that I'm ashamed to admit...it has been like this for over 2 years. I know... absolutely shameful! Why have I not done anything about this eyesore until now? I have no clue! All I can say in my defense is now it's done and the ugly is out of sight. Thank heavens! I just so happened to have a couple new drop cloths sitting in my closet not being used. You know, cause I have absolutely nothing to paint (hahaha). I thought they'd be a perfect no cost solution to my little problem. And they worked beautifully. Except for the fact that I completely forgot that I'd intended to put in a fake inverted pleat in the front. It really would have looked so much better and much more polished. But that's what I get for working on my projects until 2:00 in the morning. I wasn't functioning on all cylinders. I love the look of this nail head trim! It is not perfect or straight, but I can live with it. I have been looking for the kind that comes on a roll, but haven't been able to find it anywhere. So I sucked it up and used the box of upholstery tacks I already had. Only problem...I had to measure and hammer in every single last one, which was close to 100 upholstery tacks. It really was not hard, just a little time consuming because I wanted them to look as even as possible. I measured each one 1 inch apart and hammered them in as I went. I am pleased with the way it turned out, but think it looks a bit plain. What do ya'll think about adding a big monogram to the front? Maybe a big "S" with an oval around it...what do ya think? I'd love some suggestions or if you think I should leave it as is. Let me preface this post with an apology. For all of you who think I might have it all together, with everything in it's place and all of it beautifully organized...I am so sorry to burst your bubble. Exhibit A : my cabinet of treasures. Does anyone else have a closet similar to this? Or a drawer like this? And perhaps, a beautiful un-accessorized piece of furniture like this? I love this armoire. But for the last 6 months or so it has been empty and boring. Why? Because I thought I didn't have the "right" things to go up there. And I certainly didn't have extra money laying around for new accessories. So I did nothing. I let it sit...and be boring...and it bugged me. Until the other night when it hit me...BAM, like a ton of bricks. You have ALL the "right" things to go up there. Why do I collect things? Why do I have closets and drawers full of treasures and hand me downs? Because those "things" actually mean something to me. Many of them have been gifts from sweet friends, or passed down to me from grandparents, or given to me by my own parents. So, why then would I hide them and not proudly display them? So I went on a search of things that were special to me, and this is what I came up with. Exactly the "right" things in exactly the right place...of prominence. A hand painted tile from a dear friend, some old books from my Dad, and my Grandmother's copper firewood bucket. Do you have an area of your house that has gone without attention? Maybe because you thought you didn't have the right things or enough money to buy those things? Think about what you already have, about what you love, and what really matters most to you. I bet you will come up with something beautiful and unexpected and absolutely better than anything you could have bought at the store. 98% of the items on this wall are from yard sales. Some of them started out pretty, while others needed a bit of a spruce up. I always try to look at things and see their potential. Could that ugly gold shelf be painted? What if I took the outdated print out of that frame? Maybe I could make something cool out of those old chippy metal key thingies. Try and see those ugly yard sale items with new eyes. Imagine what a little paint or stain could do to transform them. Do you have a closet or drawer full of things you've picked up at yard sales? They are probably all very different and may not look good together. But if you unify them with, say, the same paint color, you'll have a wonderful new display of like items that will be beautiful grouped together. You'll be surprised what a little imagination and creativity can do to make an ugly duckling into a beautiful swan. This very gold and very ornate shelf really didn't fit my style. But with some antique white craft paint and a piece of sandpaper, it is transformed into a beautiful display shelf for my nest and chippy bird (see picture above). I painted all the frames a similar color and distressed them a bit to tie the whole arrangement together. This display is a mixture of yard sale, 90% off Hobby Lobby, and Ross. If you don't have a Ross, it's like the cheaper version of Marshals or TJ Maxx. All three of which I looooooove. You can find awesome deals and very unique items at stores like this. You just have to be there at the right time, cause the good stuff goes fast! Find out when they get their shipments and plan your shopping trips accordingly...it's worth it to plan ahead. Although, most of the time I just wing it and happen upon good stuff too. So I guess it works either way! Oh...and I'm linking up with Kimm from Reinvented for Trash to Treasure Tuesday. Go check out all the fun projects and before and afters. And to make the deal even sweeter...she's having an awesome giveaway for a $25 gift card to Home Depot. Whoo-hoo... gotta LOVE that! A Winner and Some Thrifty Treasures! Yah...I am sooooo excited to send this little bag of white pumpkiny goodness to my sweet friend in Canada! Whoo-hoo Mandi...you WON. Shoot me an e-mail with your mailing address and I'll try to get it off in the mail tomorrow. Now, on to my weekend treasure. My very favorite thing I found were these adorable shoes. I paid a whole dollar for them (Stuart Weitzman). I felt so sassy wearing these while leading the music at church today! A HUGE seagrass looking laundry basket for $2. Love it! Glass canister set from Pier One for $5. I am so excited to add this to collection of glass containers for my future craft room! The cutest little set of cupcake party favor containers for $1. I am going to have to hide these really well from my 3 year old or they won't make it to her birthday. She would confiscate them for her play kitchen in a heartbeat! And last, but certainly not least, a brand new (to us) bicycle for my 10 year old. I paid $15 for this bike, but it would easily cost $100 at the store. If you'd like to see more thrifty goodness, head on over to Ms. Rhoda's place at Southern Hospitality. Her weekly Thrifty Treasures Party never disappoints! Remember when I said I was sooooooo ready for the kids to start back to school? Well, I thought that this was what I wanted... but it wasn't! After the boys left for the bus stop this morning and the house was weirdly quiet, I decided to do some laundry before the girls woke up. When I went to cycle the first load I found these little guys. I usually find at least a couple of them in every load of laundry, no matter how many times I ask the boys to empty out their pockets. Normally I would be annoyed and laugh it off. But today I felt something quite different. In the stillness and quiet of the morning I felt longing...for the noise...for the chaos...for my rough and rowdy boys...for the sweet joys of motherhood! Looking at that pile of lego men and various parts and trinkets, I wanted to grab my little guys and hold onto them forever. They started 4th and 5th grade today. I remember when I was their age. I thought I was so big and bad and all grown up. But I still see them as my babies. My boys. They will always be my babies...my boys...no matter how big and bad and grown up they get. So in my moment this morning I decided to try and never get annoyed by those sweet reminders of my precious little boys ever again! I will look at that pocket full of clone troopers or rocks or whatever it may be, in a new light. I will look at it with joy...with gratitude...and with a heart full of a mother's love! I feel so blessed to have the privilege of being a mother. I will treasure it everyday, even when that pocket is filled with melted crayons from the dryer. My boys and my sweet 3 year old living the good life in our ghetto pool. This is a picture from our first annual Father's Day softball game 2008. I have 5 siblings and there are 17 grandkids so we had plenty of people to make teams. It was a blast! And please note that my family decided to go with the redneck theme based on my hubby's t-shirt. It had a picture of a camper with the caption "Living the Dream" underneath. Thus the bad hair and photoshopped facial hair on the boys. My hubby really enjoyed working on that and made it our screen saver. Love him! I really do...I love them all. Through all the craziness and the chaos and the fighting...there is whole lot of love. "All you need is love, love is all you need." Aaaacccckkkkkk....is this not the CUTEST thing on the planet? 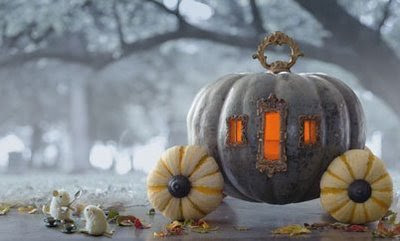 I had no idea my love for white pumpkins ran so deep till I spied this adorable Cinderella carriage crafted from them. Decorating for fall is one of my absolute favorite things to do. And I look forward to it every year. The smells, the colors, the flavors, the weather. Although, in the south that cooler weather we all long for rarely shows up on time. Usually it makes an appearance closer to November or December. So unfortunately I have a much longer wait than most of you...which is so tragic since I LOVE the cold. Weird preference for a southern girl, right? Love the south...hate the weather. Now I'm sure y'all are wondering where all this talk of fall is coming from. Let me tell ya girlfriends...the air here is so thick and steamy that you can hardly breathe. Today it was only 99 degrees, but the heat index made it feel like 199 degrees! Within minutes of walking out the door, I am drenched in sweat...like a man. Yes, I sweat like no woman should. I am a big sweaty pig of a man. I feel sure I have some glandular problem. Even the $10 clinical strength deodorant doesn't help. And now that I've re-read what I just typed, I see that I have given WAY too much information. Serious overshare...sorry! On to less disgusting topics...how about something pretty? Ahhhhh yes, much better. 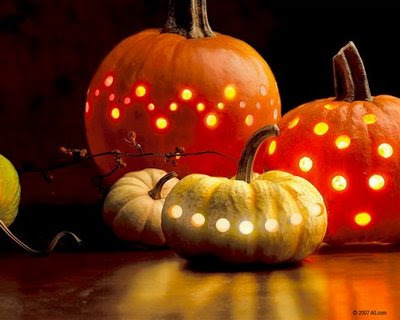 What could be better than a beautiful display of fresh pumpkins?Polka Dots! So simple, yet so elegant. Really makes for a striking display. Don't you think? Last year I went a little monogram happy. I used my scrapbooking rub-on letters to create personalized pumpkins. And painted ugly dollar store pumpkins black and white and added polka dots. I can hardly wait to get my white pumpkins out of storage and put up some fun little vignettes like this one. Last week while in the dollar store I spotted a basket full of assorted pumpkins. I got all giddy just imagining that there might be some white ones thrown in there. So I went to digging and found 5 (like the medium one pictured above). And guess what? I'm giving away 3 of them to one lucky reader. That's right...leave a comment on this post to be entered to win a treat bag full of white pumpkin goodness. I will draw a winner this weekend and announce the winner Sunday night. Aren't random Halloween giveaways in August fun? Hey friends! Sorry I've been MIA for a few days. Back to school preparations are in full swing here since we start back on the 6th. I just wanted to show you a couple new things I added to my etsy this weekend. I am in LOVE with these wood block message centers. They're so very versatile...great for holding that ongoing grocery list that's never done! Great for leaving notes for the fam too! You could also use it to hold recipes, pictures, coupons, mail, etc. That is one mega heavy duty clip at the top, so I think it would hold pretty much anything you fancy! I think they're fun. I have lots of new inventory in my shop, and will be adding to it daily for the next couple weeks. I'd love for you to stop by and see what I have to offer. 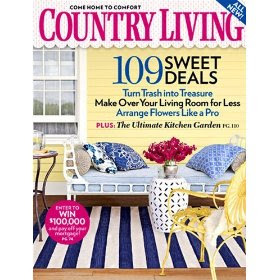 Do y'all love Country Living as much as I do? Well, I just had to share my crazy good deal with ya. Amazon is offering a one year subscription for only $5 (discount is shown at checkout). Can you believe that? It's only good through the 8th so you better hurry and get one before they're gone. They have more to choose from too...like People Style Watch, House Beautiful, and many more. Last month I ordered Real Simple magazine for $5 off Amazon too. I love me some good mags...I'm a magazine junkie! And I'm pretty sure there are more like me out there! Here is the link if you're interested.